I am a passionate, animal-loving, bleeding heart rescuer. At the end of the day, I just want all these animals safe. I want to stop the horrors of abuse, neglect and the disposal of unwanted creatures. But my voice can only carry so far and my dollar can only stretch a little. So I decided to take care of what I could in front of me. I chose to work within my community to make a difference. 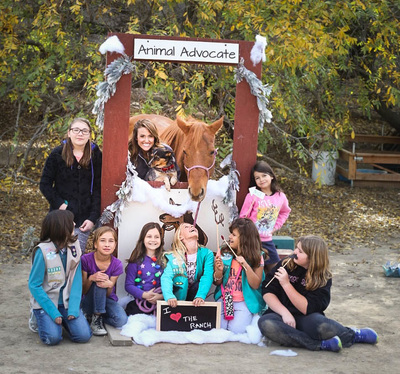 It started with caring for and training animals and then it grew into animal rescue and horse sanctuary. Well, my mom always said, “If you are going to do something, do it right.” Therefore, I am the Founder and President of a registered state and federal 501c3 non-profit organization. Even though it was expensive, felt difficult, and took a long time, I knew that it was necessary in order to offer a legitimate service and program. I believe that if someone has a worthy cause and trustworthy intentions, it is only a natural progression to turn their mission into something transparent, defined, responsible and accountable. In the case of animal rescue, that would lead to the development of a 501c3 organization. The type of organization that requires board members for decision making and accountability. Tax-exempt organizations require a clearly defined cause for the benefit of the public, rules for operating, the reporting of financial records, and so on. Each aspect vital to the efficiency and integrity of a charitable cause benefiting the public instead of harming it or taking advantage of its supporters. I’d love for all the members of the animal rescue community to be of the same heart and integrity. But it just isn’t so. These sad stories, pitiful looking horses and the threat of slaughter make people panic and want to help. That’s not the problem. Unfortunately, some people prey on that, which is the problem. And to some, they don’t care if you are a good-hearted animal lover or kill buyer, a customer is a customer. So the cycle continues and the wrong people benefit. Happy to assist with part of a horse’s ride to freedom, I agreed to transport the horse from the group’s location to the new home without compensation. Since this was a well-known group, I didn’t even think to check on the validity of this rescue operation. Upon arrival, I immediately felt concern for the situation. I pulled up to a residence with a chainlink fence securing a group of ill-looking horses standing next to numerous vehicles and old outdoor furniture. It was January and there was no windbreak other than the cars and nothing overhead to shelter them in the event of rain. Eventually, a man came to the fence and let us in to pick up the horse. The little mare was young, thin and visibly ill. Her head hung with snot dripping from her nose and her eyes troubled by mucous. I loaded her in and left with one piece of paper, an Equine Infectious Anemia Laboratory Test. As soon as I got in the vehicle, I called the trainer to advise her that the horse was very ill. The trainer was prepared with medicine through the advice of her veterinarian and an appointment for care scheduled. In the days succeeding, it was confirmed that the horse was suffering pneumonia. Then, the results from the blood work confirmed that the mare was infected with Strangles, a highly contagious equine disease. The horse was treated for her ailments and infectious disease precautions were carried out to protect the neighboring horses. I wish I could say that the problems ended there but that was barely the beginning. The information on the horse’s paperwork didn’t match the horse received. In addition, an acquaintance had also rescued a mare and foal from the same shipment and she had issues with her situation as well. 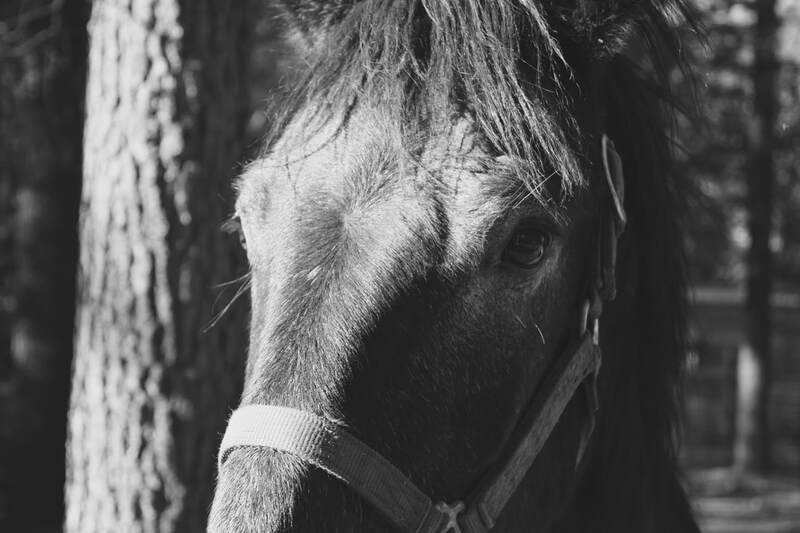 Questions and concerns were raised about the conditions of these horses, the transport, the money donated to the group, the hazard of these horses entering the community and the kill pen system as a whole. Now, I’d have to continue a lot longer to provide the rest of the details and exposing all the problems with this situation. There’s a concern for why this “rescue” works so closely and frequently with Bowie Auction, why the “nonprofit” is not registered, what the fees are and where they actually go, and evidence of fraudulent representation and operation. I believe this is part of a kill pen scam and there are a lot of moving parts. I alone cannot explain or figure out this whole situation, but rest assured, the eyes of this horse community are now open. As I explained earlier, I feel my effort is best focused within my community and where I can do my best to help or inspire change. 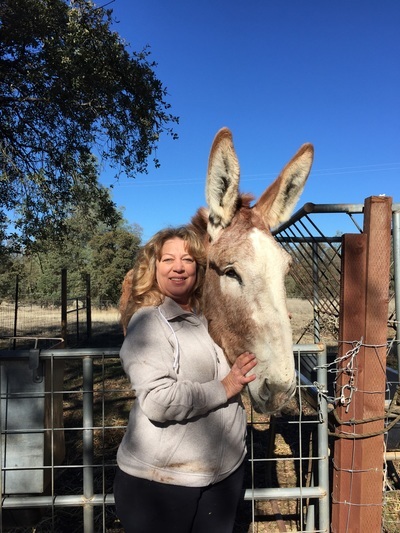 My intent is to implore the members of this community, and especially, the media to question and investigate the monthly transport of Bowie Auction horses into El Dorado County. We have a confirmed case of strangles that came in with a truckload of exposed horses. Experiencing that first hand, and knowing that the group responsible has been notified, then why have there still been multiple transports since? If the intentions of this group are honorable, then why haven’t they taken steps to improve their facility to better care for high-risk rescue animals? Are they operating ethically? 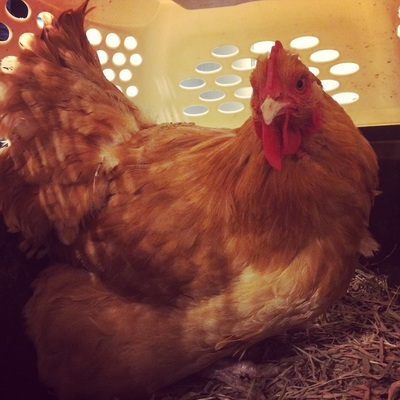 Are the animals healthy enough to make such a long trip? Are they who they say they are and representing themselves honestly? As the founder and operator of an animal rescue organization, I truly understand the effort and responsibility required of a nonprofit. Our mission is the welfare of animals and our programs are to benefit the public. However, this group’s operations and lack of responsibility contradict the intent of a true nonprofit organization. Especially, if the community is contributing, then the group has the responsibility of being well managed and truly benefiting the intended. Auction horses aren’t everyday rescues. The facility accepting these unique situations needs to reflect the nature of the work and danger. They have a responsibility to be set up for the type of rescue they are trying to facilitate. Otherwise, it is irresponsible. 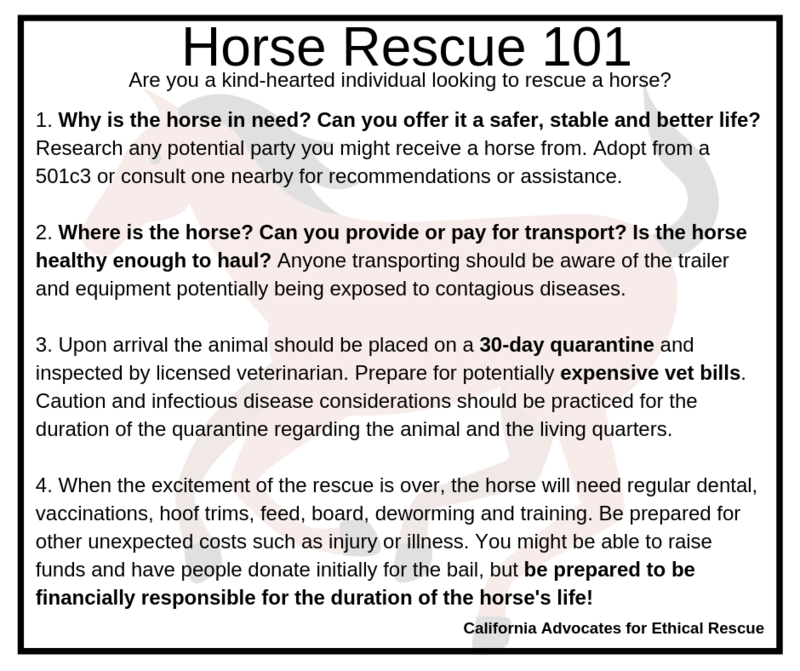 As an established group, recognized by the media, that is receiving community support, and transferring horses regularly, I expect decent quarantine, care and accommodations for sick horses. A legitimate intake protocol, treatment and quarantine should be under the direct supervision of a veterinarian. It is my sincere hope that the group discussed can reform their operations to carry out honest and good work without posing harm to our community. Members of the community should be encouraged to seek information about groups they intend to support and where they get their horses from. If the intent to rescue a horse has been placed on your heart, then please, visit your local county shelter or reputable 501c3 organization. If you choose to rescue independently, the informative image below might help you avoid some common mistakes and heartache. The Kohagen home and sanctuary lacked the sweet purr of a cat. Our hearts were heavy over the loss of Spike. A little girl searched throughout the house for her feline friend. It was time, we drove down to the local county shelter to pick out a cat in need. The three of us took our time meeting all of the cats who had been there the longest. Jason and I were going back and forth over two cats that we liked. My pick, a little black cat. For Jason, a large grey tabby. We paused our debate to watch Hadley playing with a sweet male tuxedo cat. He followed her all over the place. They played and exchanged affection. We looked at each other and knew neither of us would be getting our pick. A cat had chosen us instead. We notified the front desk that we were interested in adopting the young tuxedo cat. The kind lady was very excited and told us more about him. He had been captured as a stray. He patiently waited to be claimed. Then he patiently waited to be adopted. One day, his owners walked in, saw him and mentioned to the front desk that he was their cat. She assumed they would be back up to the desk to bring him home. Sadly they disappeared. Imagine the heartbreak of that cat watching his family leave him behind. Hearing this story melted our hearts and we knew he was the one. We named him Gatsby. He became the greeter of the house. The purr and cuddle we longed for. Gatsby was Hadley's best friend. If she was upset he would run into the room at the sound of her cry and lovingly bump heads. Gatsby had medical issues from the start. we were in and out of the veterinary clinic multiple times for mysterious allergies and symptoms. We cared for him the best we could and found a diet that made his symptoms manageable. Around a year later, Jaxon arrived. Gatsby immediately became his big brother. 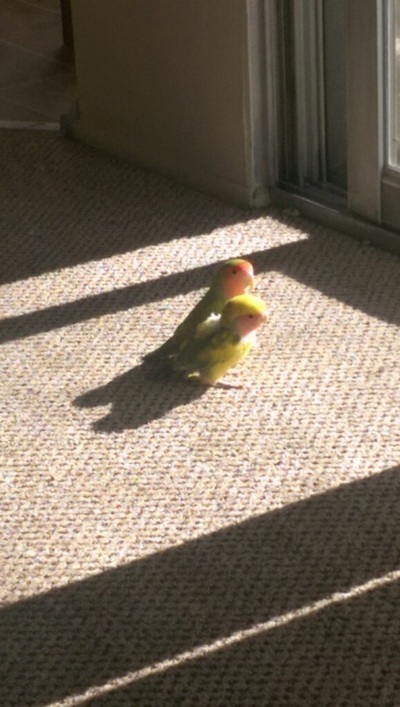 Those two were the most loving and playful pair that I have ever seen. Then, after another year passed, we took in a two to three week old kitten. At first, Gatsby and Jaxon were completely spooked by the little fluff ball. 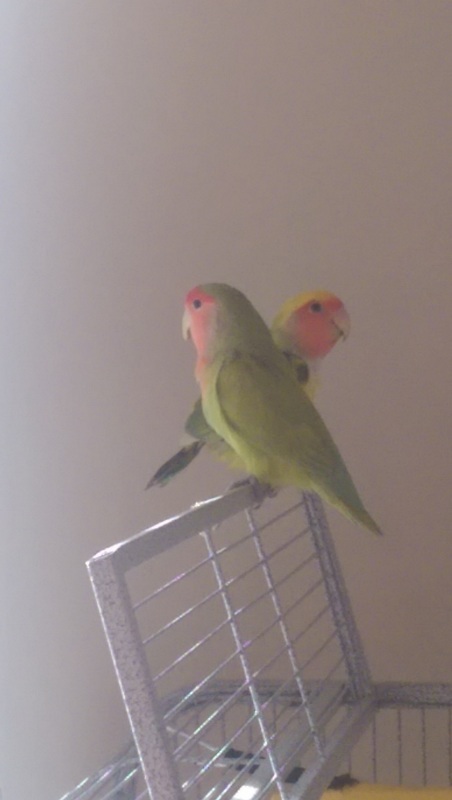 After a few weeks of quarantine, I began to let them see each other. Jaxon wanted nothing to do with the kitten. Gatsby however, started licking the little newborn. I couldn't believe his paternal instincts and concern for those in need. This abandoned kitten needed the love of a cat so bad and Gatsby took to his every need. We named him Wyatt. Gatsby, Jaxon, and Wyatt were quite the crew. The house was never quiet, especially when we were trying to go to bed. But our hearts were full and they were happy. A few weeks ago, we noticed a change in his behavior. He very quickly declined and we rushed him to the vet. He was held at the clinic for days while they treated his urinary obstruction. 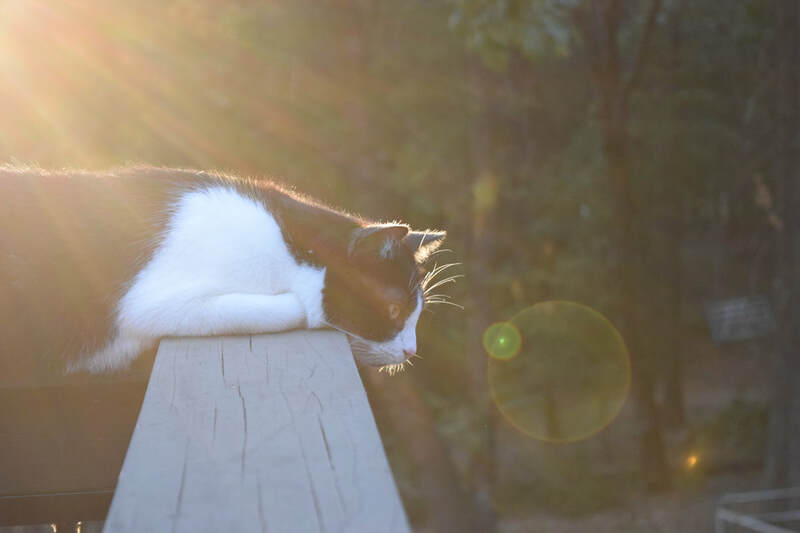 He had many complications due to the condition of his bladder and need for nutritional adjustment with consideration for his severe allergies. He had finally stabilized enough to come home. We were happy to care for him, Hadley included. Gatsby seemed to be recovering. One morning, Hadley and Jason were monitoring him and he seemed perfectly fine. Hours later, we were shocked to discover he had died. After consulting with our veterinarian, we came to the conclusion that there must have been an unknown condition or maybe his organs had just been too taxed to fully recover. We will never know. What I do know is that the sweet cat who came in as a stray, who was abandoned by his owners at the shelter, was absolutely loved to the end. I wish he could have known that when we were getting hammered financially, people came to our aid for him. Ranch supporters donated to his care and checked on him. The unwanted shelter cat's story had raised over $1,000 for our vet bills. While we are deeply saddened by the loss of Gatsby, there is a beauty to his story. I believe that we all just want someone to love us and be willing to fight for us. His last years were filled with the love of a family, feline fun with his brothers, and his impact through interactions at our sanctuary. Our Great Gatsby is gone from our physical touch. But as we have explained to Hadley, he lives in our hearts. And that is the best home you can give anyone. We truly hope that everyone had a safe, prosperous, and healthy 2017. For us, it was a year of growth, settling in, and making connections. We were embraced by our community, inspired by our participants, and supported by our amazing contributors. The sanctuary received many new animals and we had a few bittersweet, but ultimately awesome, adoptions. Such a blessed year! As our organization begins another year, the board members revisited our mission and goals. As we continue to settle into a new community our programs adapt to provide experiences beneficial to its members. In 2018 it is our continued mission to ensure a safe and happy home for animals while providing special encounters and educational experiences. 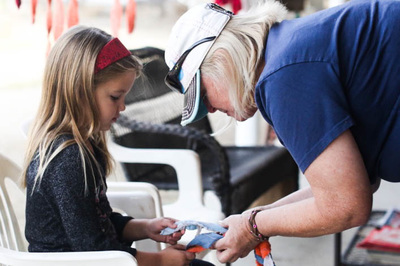 A passion for animals and the joy they create is the foundation for our cause. It is The Ranch’s goal to inspire people to protect and embrace the creatures we share this world with. 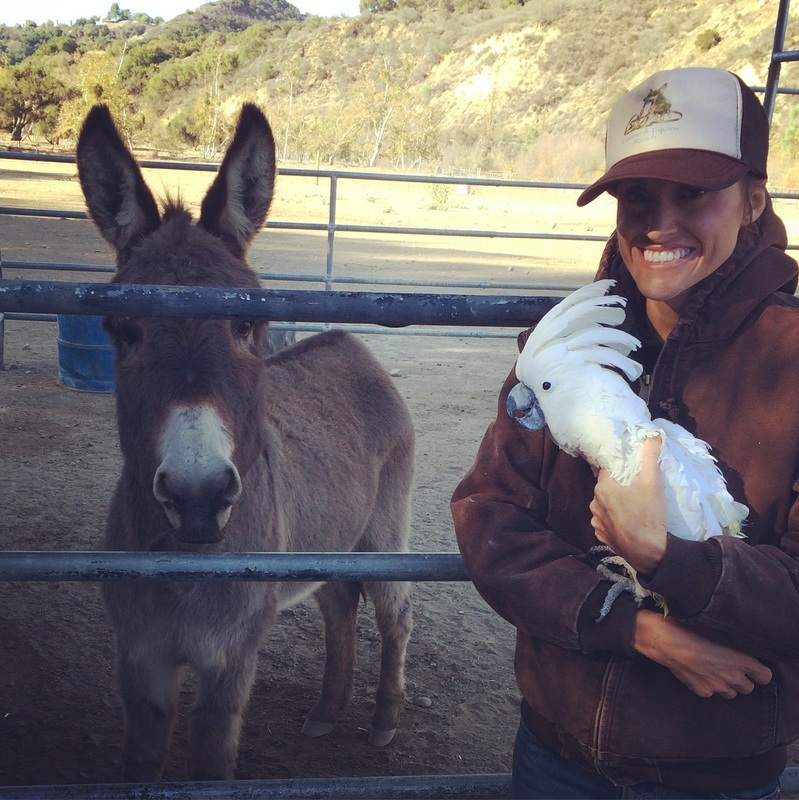 Let us continue to spread the love, laughter, and smiles the animals so generously give us! From all of us here at The Ranch, we wish you a blessed 2018! I began working with Casper 5 years ago at his place of residence. He sang, we cuddled, and I taught him to play fetch. We spent many hours in his aviary with his buddies, Rudy & Annie. 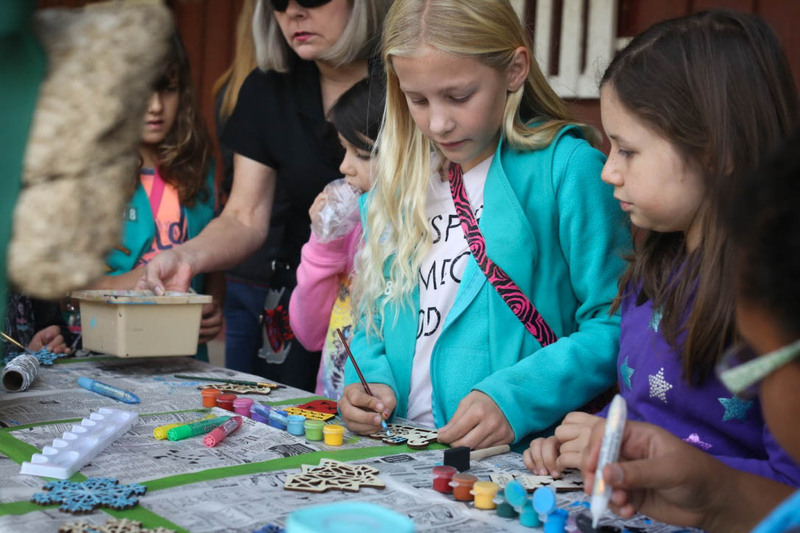 I loved putting on "shows" for visitors and we had a lot of fun connecting with so many people of all ages. Casper makes everyone smile and shocks them with his intelligent and affectionate nature. Unfortunately, life took me away from him for a little bit. Casper grew lonely and began plucking feathers. 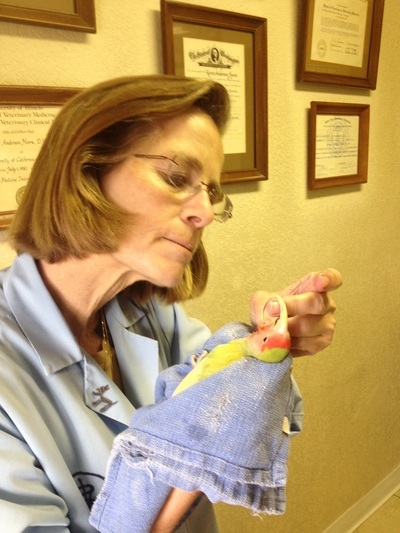 I was delighted to be contacted to resume working with my feathered love and eager to make him healthy again. We laughed, played, and of course cuddled. All was well. 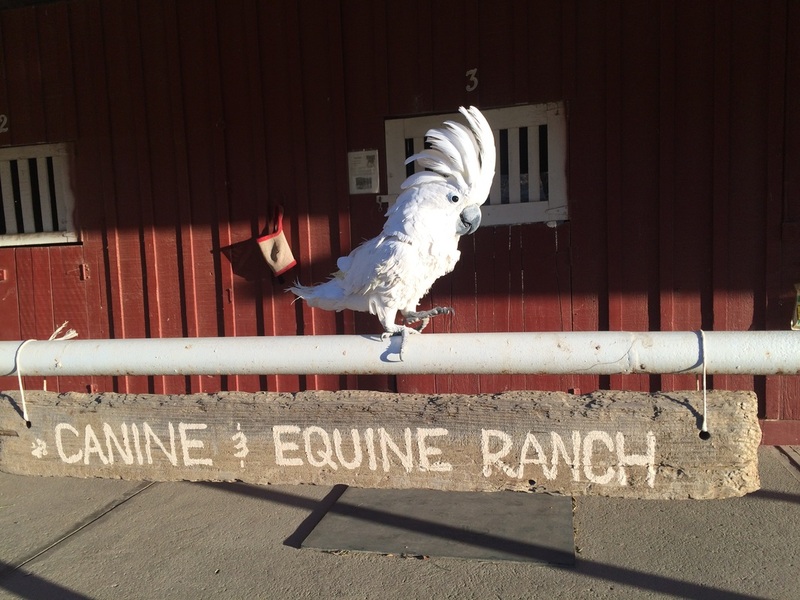 At one point, The Ranch had the opportunity to care for Casper at our facility. Then, the real fun began! I introduced him to so many animals. It was amazing to observe him discovering life outside of an aviary and away from a place of business. He loved the ranch and we loved him. His favorite animal was Frankie, a donkey. 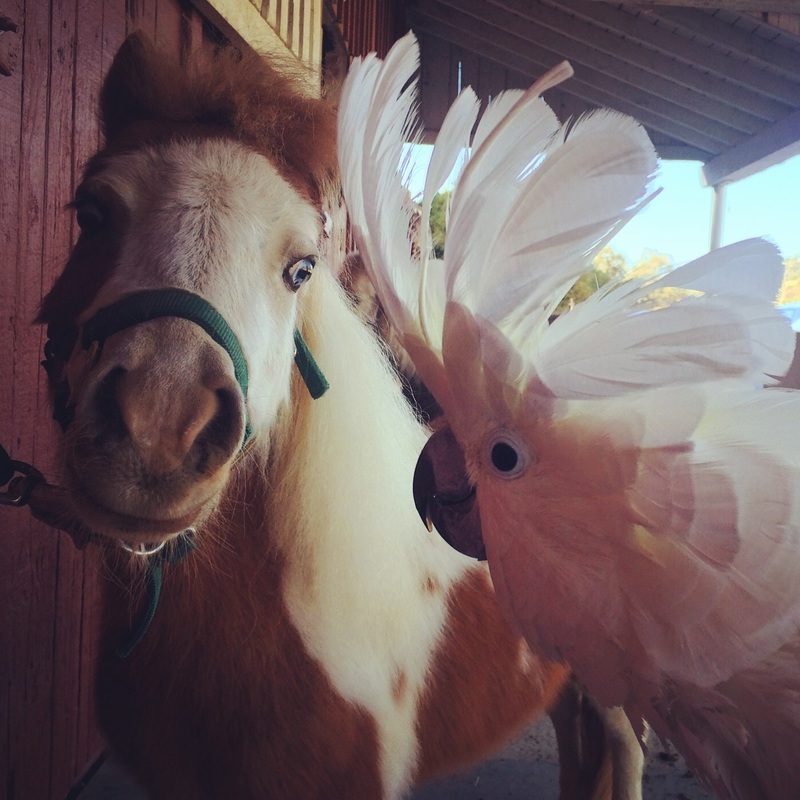 Casper truly enjoyed all the animals and excitement of the barn. 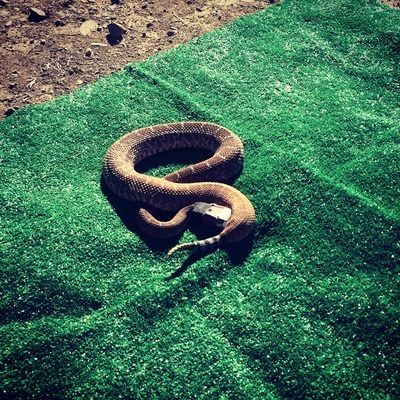 He was a hit with animals, volunteers, and visitors. Casper was such a source of joy; the kind of spirit that makes you feel like a kid again. Once more, life would pull me in another direction. I had to say "See you later" at the end of 2015. I thought I would. I hoped that someday he would retire to our sanctuary. I won't get to hold my sweet friend again. I'm utterly devastated. I find comfort in our beautiful memories and the hope that we touched the lives of others. 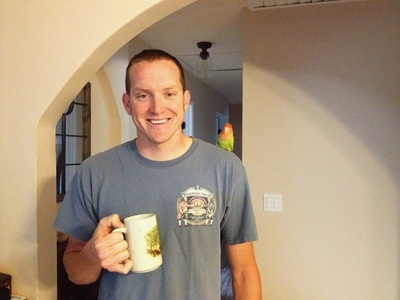 I did a lot of advocacy and taught people about the serious commitment that one makes when owning a parrot. We taught people about their delicate nature and complex personalities. My wish for Casper's legacy is for humans to recognize animals as sentient beings, people, and friends. 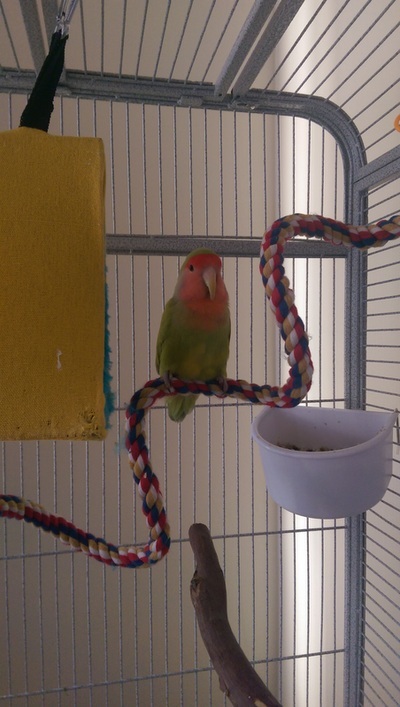 If you are interested in owning a parrot please contact a rescue or sanctuary for assistance. Congratulations on your new rabbit! 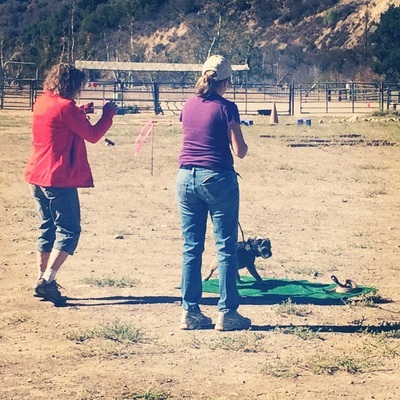 ​We want to make sure that you and your new family member start off in the right direction! Unfortunately, rabbits are one of the most euthanized animals due to overcrowding at shelters. The common misconception is that they are a "good starter pet" and they are frequently gifted during Easter. 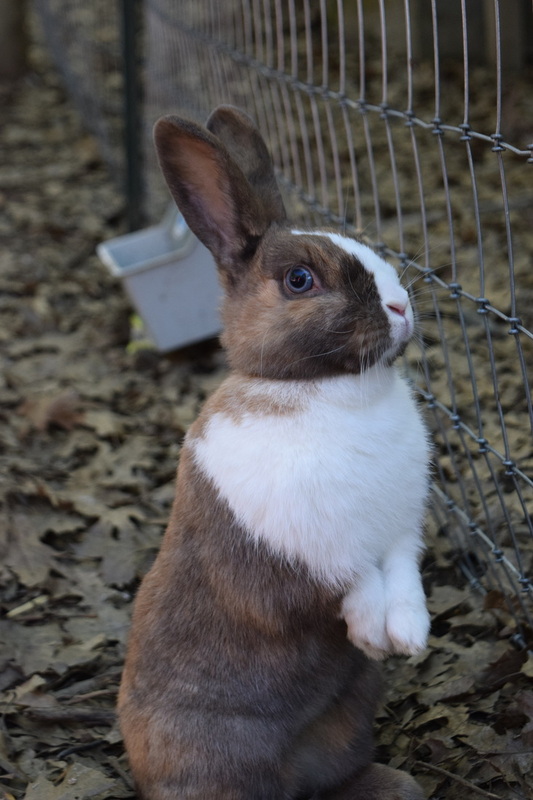 While rabbits can be a precious gift we want to make sure that you have a successful relationship that doesn't end up at the shelter. Most people don't know that rabbits require as much attention as a dog and have similar behavioral needs. They should also have veterinary assessments much like a cat or dog. Rabbits are fragile; therefore, multiple habitat and nutritional considerations must be made in order to have a happy and healthy pet. Taking care of a rabbit can be so much fun with the tips and guidance of excellent resources. For example, did you know that many rabbits live inside the home without a cage? Thanks to simple potty training techniques, they can! Below, we have started you off with some fabulous websites and rescue groups. They have the best information and resources for navigating the rabbit world. 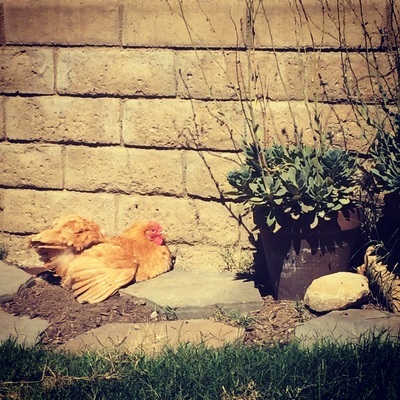 This sweet Buff Orpington has been patiently waiting to get adopted at Ventura County Animal Services. Her name upon surrender at VCAS was "Honey Glazed". We thought that was terrible and decided she needed a new life with a new name. Welcome to the flock pretty Adelaine! Dolly has been adopted by a wonderful family in Northern California! We were very sad to see her go. 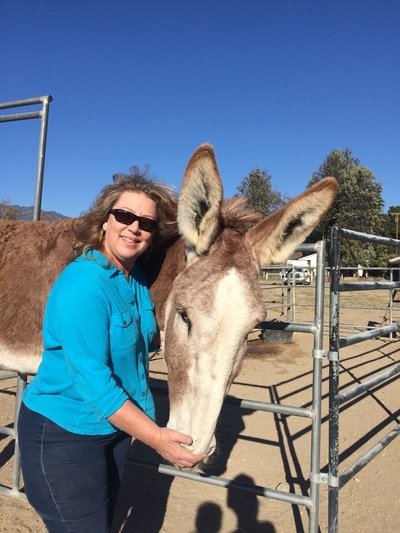 Tina and David have provided Dolly with many acres to play with mules and a miniature donkey. 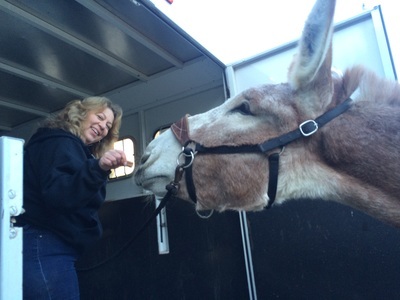 Tina hopes to eventually train and enjoy riding Dolly. We are excited to see what the future holds! Congratulations Dolly and thank you Meyer Family! Casper from the Ojai Valley Inn & Spa is on vacation at our ranch! He loves to socialize with all the volunteers. Casper loves walking the grounds and greeting the other animals with Kate. We have made so many great memories; we will be sad to see him go! 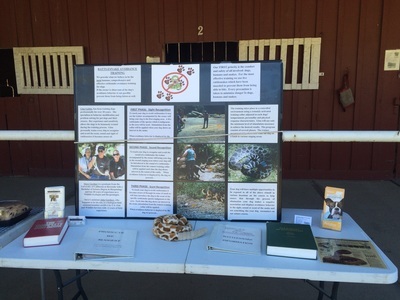 We had the pleasure of hosting Rattlesnake Avoidance Training by Ma & Paw Kennel! Gina and her team did a fantastic job! Winter Wonderland was a fabulous success! We made toys for shelter pets, created Christmas ornaments, played with the animals, and enjoyed delicious baked goods. 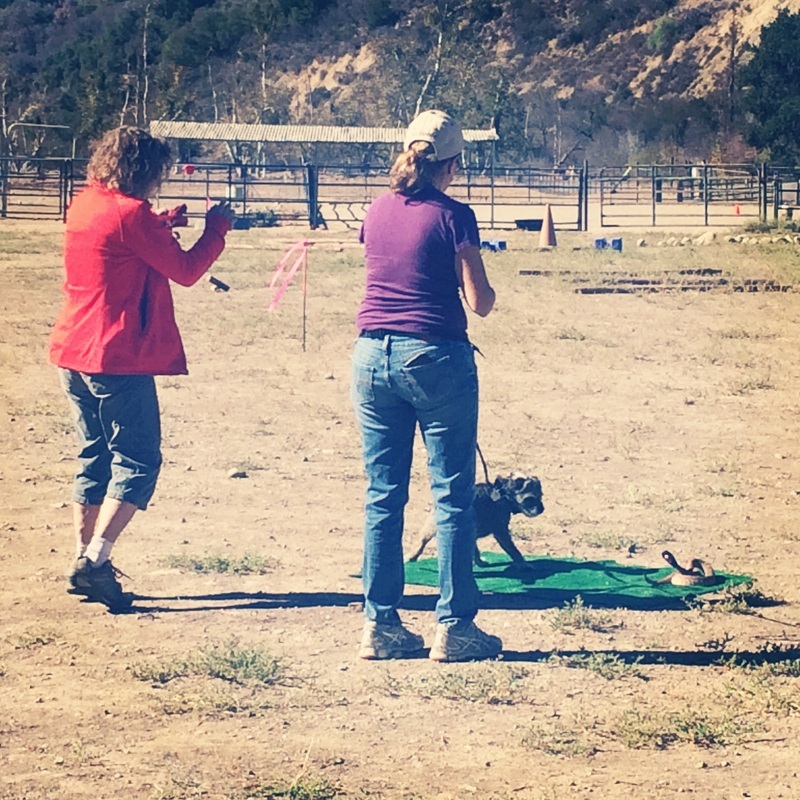 Pets Health Magazine joined us for the event and captured great memories! Our gratitude to everyone who came out to participate and support us! 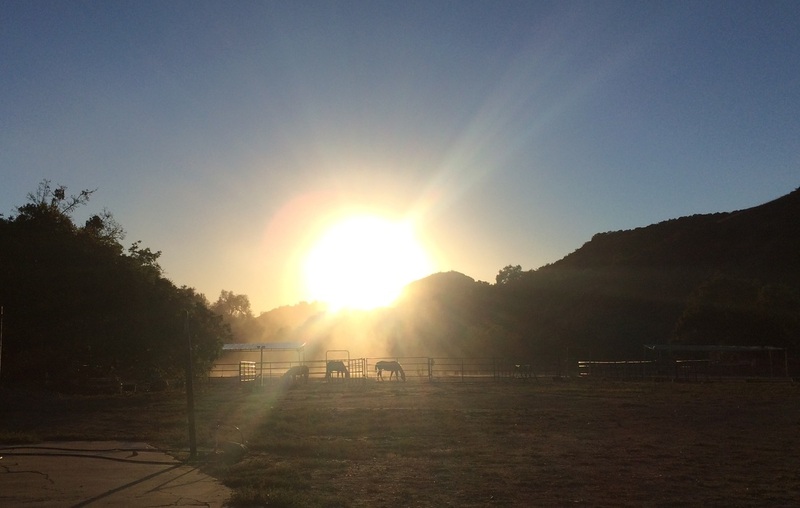 Starting January 2016, we will no longer have a public location in the Ojai area. We will still remain active in the local community through rescue and advocacy. 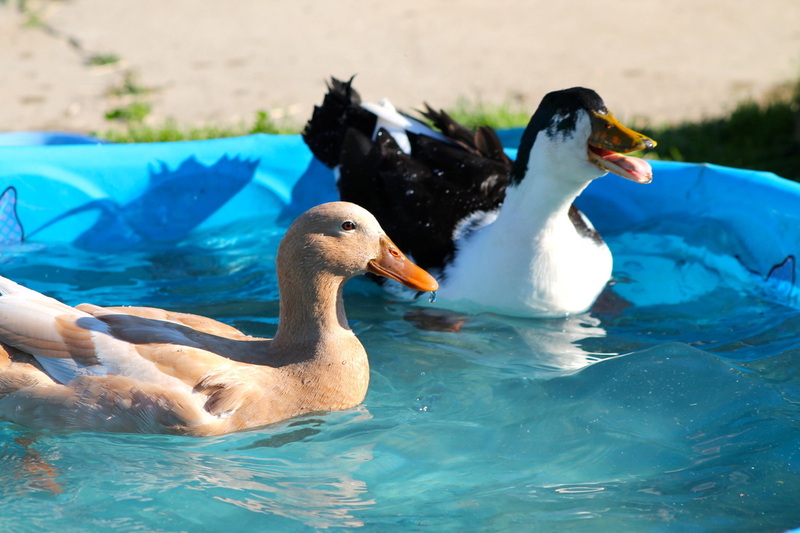 However, the majority of our animals will be relocated to a sanctuary on private property in Placer County. Kate & Jason will continue providing sanctuary, rescue services, and educational programs to the community up North. ​From our family to yours, Merry Christmas and Happy Holidays! In February, Tesla was killed by a hawk. We were all shocked and saddened by the loss of our sweet Indian Runner. His pal, Mazerati, was very lonely and insecure without a buddy. Therefore, we went in search of local ducks in need! Butterscotch and Guinness came from a local Ojai farm that no longer needed their ducks. 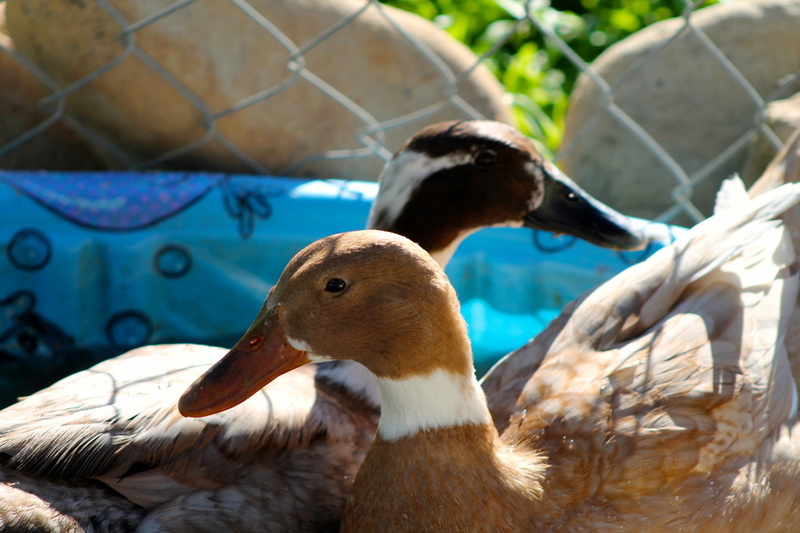 During that search, Three Dog Ranch donated two of their ducks. We have named them Carrera and Shelby! In March, we picked up a little canary from Santa Barbara County Animal Services. We named the little guy Charlie. 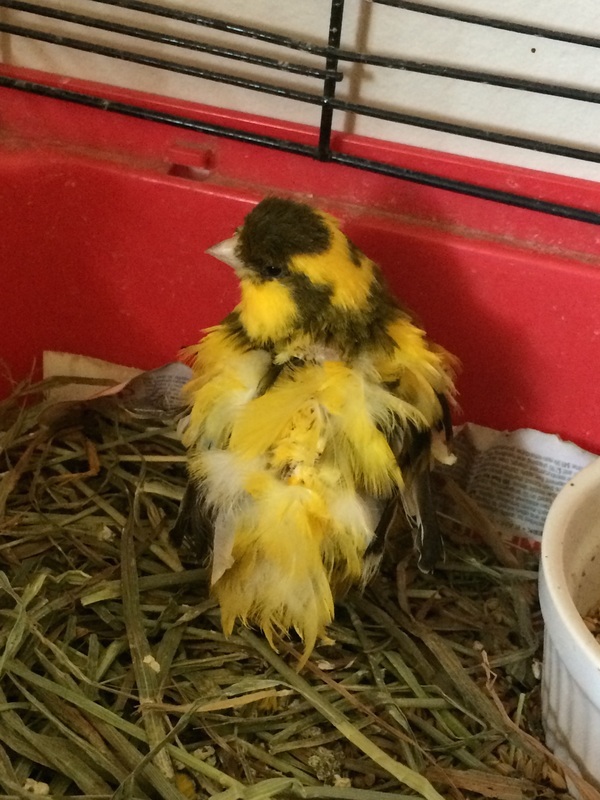 He has an abnormal feather condition and appears to be unable to fly. He also has very weak legs which cause mobility and perch issues. 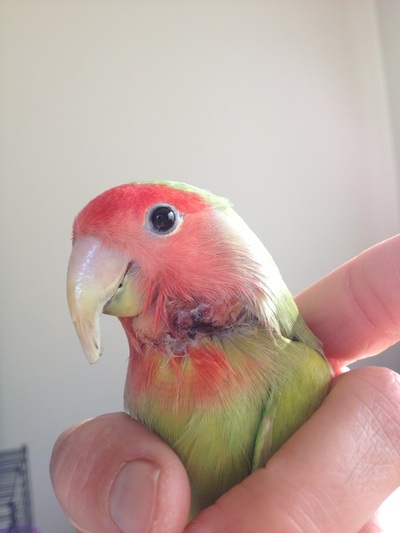 Dr. Bailey said that the feather condition is more an aesthetic issue and he seems to have a good quality of life despite a few minor setbacks. Idon came to us in May because the owners needed to downsize their goats due to a residential situation. 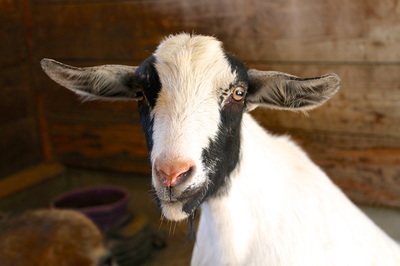 He is a big sweetheart and the other goats took to him immediately! 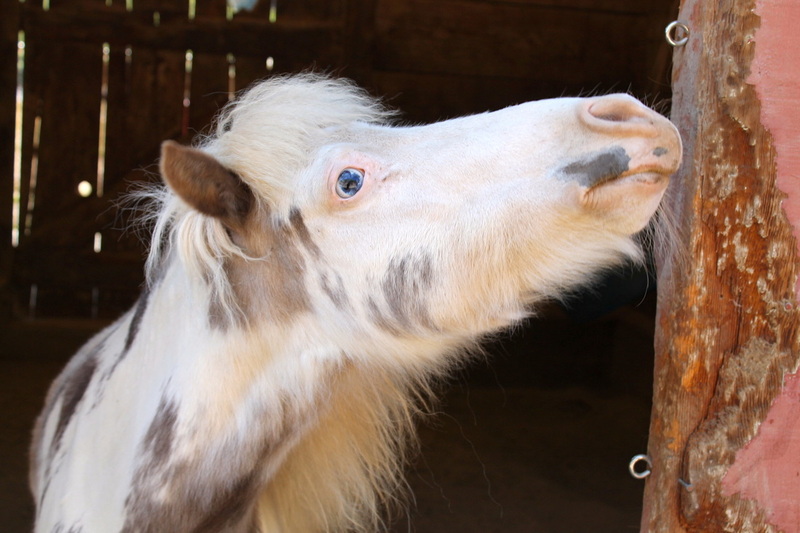 In May, we also began a search to take in a miniature horse in need. We had an open stall and we wanted to give Scout a companion of his own size. Irish came to us from a local home with a beautiful herd of little horses! Her owner was happy to lighten her work load and we were grateful to offer a home to such a sweet horse! The last intake of the summer was Finnick, the little piglet. 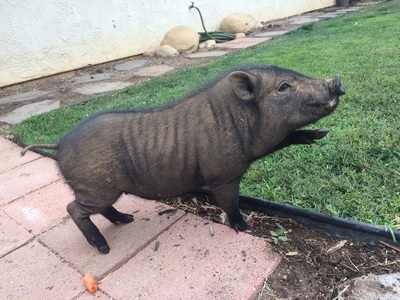 Kate saw a Facebook post on Ojai Animal Kingdom for help with a family of potbellied pigs. Finnick was one of the two remaining piglets that survived dog attacks. Concerned neighbors took in the surviving pig family and were trying to find them a home. Finnick was underweight and had never been touched. We have since brought him up to a healthy weight, castrated him, and we are earning his trust for petting. It has been a busy summer with all of these wonderful animals! A little over a year ago we facilitated the rescue and rehabilitation of a little lovebird that we named Fiona. She had been kept in the large aviary of a business. 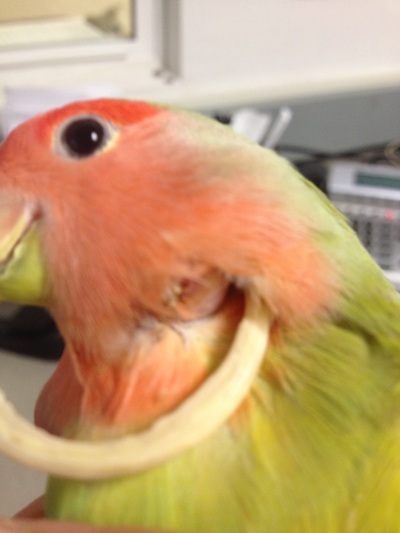 Her over grown beak had been severely neglected. 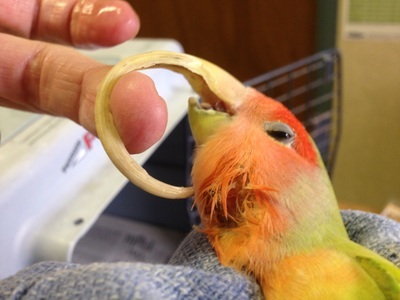 The beak was so long that it curled under and punctured her neck causing an abscess. We took Fiona to Moore Veterinary Care in Ventura. Dr. Moore successful surgery and beak trimming saved Fiona's life. 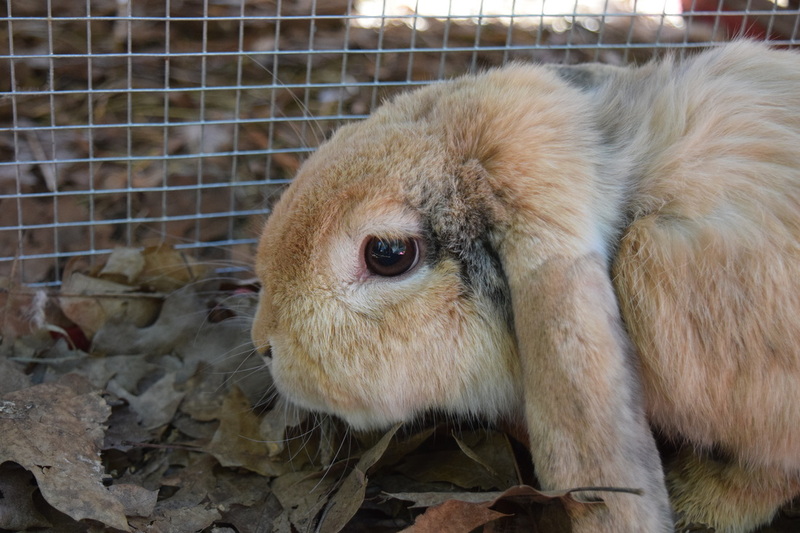 We continued her rehabilitation with medication, frequent trimmings, and lots of love! 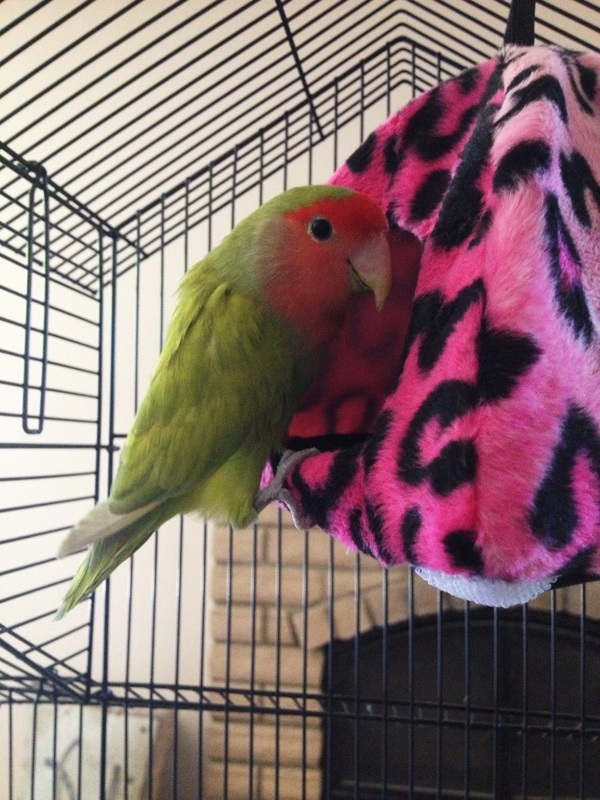 Fiona is one happy little lovebird now! 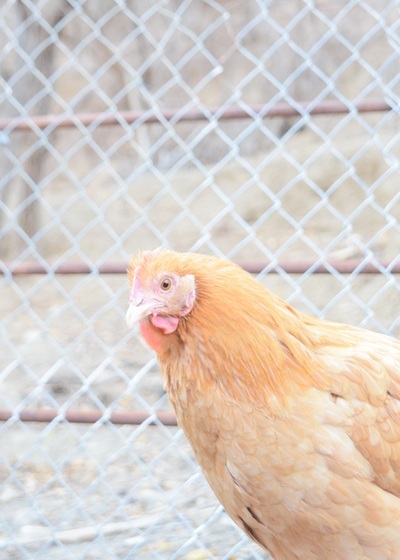 Fiona and a mate from her previous flock are now the spoiled sweethearts of their new generous and loving owner.